The city of Paris is associated with an array of different things, from love and romance to Victor Hugo’s ‘The Hunchback of Notre Dame’. But for our Victoria, a trip many years ago to France’s capital, led to her associating the banks of the Seine with goat’s cheese and caramelised onion tarts. Not a bad association if you ask us! 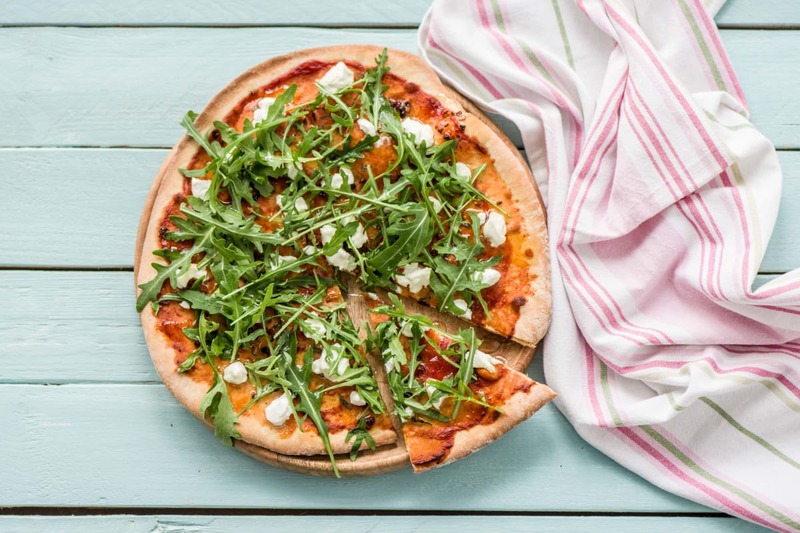 She took those flavours and ran with it - in the form of this ever so tasty flatbread pizza. Boxes and ingredients are packed in facilities that handles Peanut, Nuts, Sesame, Fish, Crustaceans, Milk, Egg, Mustard, Celery, Soya, Gluten and Sulphites. Cut the onions in half through the root, remove the skin and finely chop. 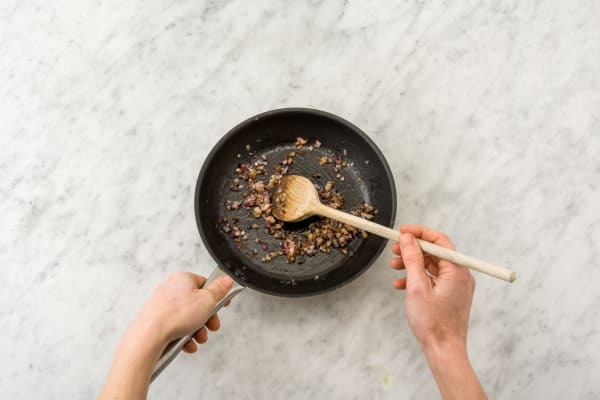 Put 2 1/2 tbsp of oil in a frying pan on very low heat, and add the onions and ¼ tsp of salt. Leave to slowly caramelise for 25 mins, stirring occasionally, ensuring they don’t burn. Add the honey at the end and cook for a further 3-5 mins. Meanwhile, mix the yeast with 200ml of warm (not hot) water and a pinch of sugar (if you have it). Put 300g of flour(ensuring you still have some leftover for later!) in a big mixing bowl and stir in 1 tsp of salt. 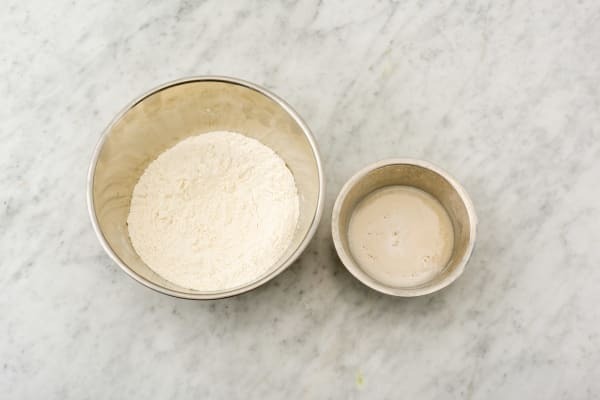 Make a well in the middle of the flour big enough to hold the yeast mixture. Tip the yeast mixture and 1 tbsp of olive oil into the well, then slowly start moving the flour in from the sides and mixing it with the liquid. Keep moving the flour into the liquid and mixing thoroughly, until you have a nice squidgy ball of dough. Place the dough on a floured work surface and knead it for 5 mins (at least!). Tip: Kneading simply means streeeettttching the dough to make it nice and springy. Hold down the end of the dough nearest to you with one hand and use the palm of your other hand to push the rest of the dough away from you in a long stretching motion. Fold it in half and repeat...you’re now kneading! Once the dough is ready, leave it in a bowl in a warm place for at least 15 mins to prove. Tip: For best results, you can leave it a little longer! 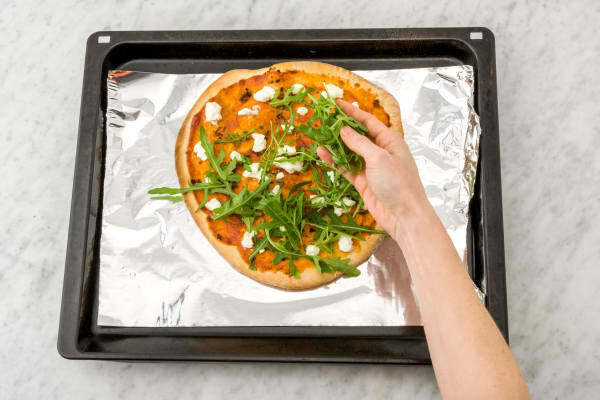 Meanwhile, pre-heat your oven to its maximum temperature and put two lightly oiled baking trays in the oven, with a large piece of tin foil on each, ready for the pizza bases. Roughly chop the goat’s cheese. Pick the oregano leaves. 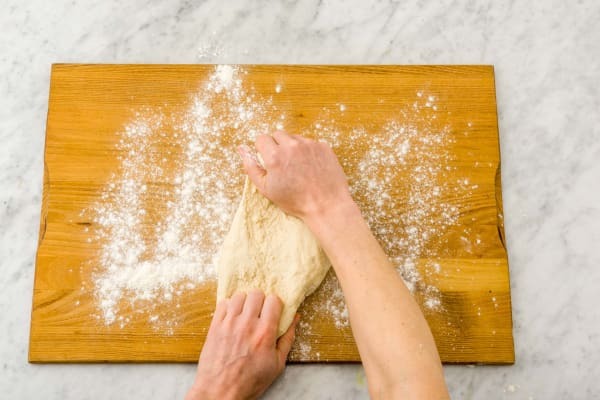 When the pizza dough is ready, dust the work surface with the remaining flour, divide the dough into two balls and roll them out on the floured surface, until nice and thin - roughly 25cm across. Tip: If you don’t have a rolling pin you can always use a wine bottle (or even a tin can at a push!). Spread the tomato purée thinly over each pizza base. Divide the caramelised onions between each pizza base and top with the oregano and as much goat’s cheese as you like! Pop both pizza bases on top of the lightly oiled pre-heated baking trays, on the top shelf of the oven, for 8-10 mins. Once cooked, top with a handful of rocket leaves and a drizzle of olive oil. Job done!